Acts 4:36-27 – Who was Barnabas? Luke gives an ideal example of a member of the early Christian community in Jerusalem: Joseph the Levite, also known as Barnabas (4:36). Barnabas is a significant figure in the book of Acts, introduced here as a member of the community at Jerusalem. The introduction of Barnabas at this point in the book is a typical Lukan literary style. He often introduces a character who will become significant later in the story (Saul in 8:1, John Mark and James, Jesus’ brother in chapter 12). While this seems the most likely explanation for the name, it is not exactly what Luke says the name means. The role of the prophet is not limited to future-telling or condemnation of sin. For example, the second half of Isaiah has been rightly described as a “book of comfort” or “consolation.” Perhaps Barnabas had a personality which could speak the truth with strength and clarity, but in such a way as to bring comfort and encouragement to people as well. Barnabas was from Cyprus. We know a community of Jews was present on Cyprus as early as 330 B.C., but they were expelled in A.D. 117. It is possible that Barnabas was in Jerusalem to serve his time in the Temple, or he may have been living in the city more or less full time. If he was wealthy, then he may have owned property in Jerusalem and Cyprus. Luke calls him a Levite. Not all Levites were priests, but typically they were wealthy and well educated regardless of their role in the Temple. Levites could be anything from priests to doorkeepers in the Temple, but they also might be scribes or teachers of the Law. We are not told that Barnabas actually functioned as a Levite in the Temple, he may have simply been from a Levitical family. On the other hand, it is possible that he had worked in the Temple and was quite “traditional” within the spectrum of Second Temple Period Judaism. What matters here is that Barnabas was from the Diaspora, but had deep roots in Jerusalem and perhaps the Temple. Barnabas sells some property and turns the proceeds over to the apostles. This stands in contrast to Ananias in the next paragraph, who claims to do the same thing but is not telling the truth. We are not told what the property is, although he may have owned some property around Jerusalem which was a source of income for his family while he worked in the Temple. I think that it is important to observe here that Jews living living outside of Judea are not automatically “more liberal” on matters of Law. In fact, it seems to me that the violent resistance to the preaching of the Gospel in Acts comes first from Diaspora Jews, not the Aramaic-speaking Jews. That Barnabas has two Hebrew names, hast the title of Levite, and had some property in Jerusalem implies that he was less Hellenized and more traditional with respect to his religion. E. Schnabel, Early Christian Mission, 1:788-790 for detailed information on Barnabas. It is so important when reading the Bible to truly take time to let the words sink in and meditate on them. There are so many details that one would miss if you did not take time to find meaning behind them. When I read Acts 4 I thought it was interesting how Luke mentions a specific name of an individual who was of the Christian Community who sold his personal land for the benefit of people who were in need. 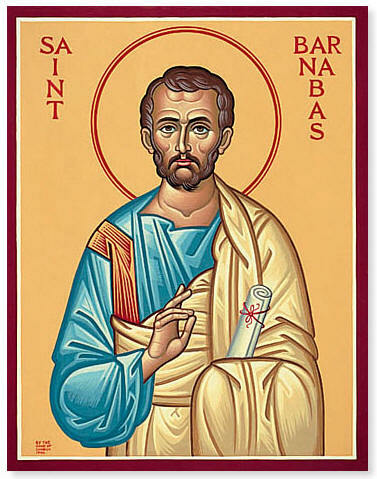 Barnabas was the name that was specifically mentioned as this individual who selflessly gave to help others. While reading I remember thinking how it was interesting the description given for him and his name meaning “son of encouragement” This is so cool to see how through our actions we can encourage people in so many ways. I really liked learning more about Him through this Post. I like how our professor talked about the difference between Barnabas and Ananias who both sold property but for different reasons. Ananias for his own personal gain and Barnabas for those who were needy. It is not safe to assume that just because you are in the more secular places you will be more liberal. I think that we can see these two examples and clearly apply them to our own lives. We can choose to be someone who encourages like Barnabas and does things with pure motives or we can choose to do things for our own personal gain like Ananias. I have seen this so many times and it is a good reminder for me to check where my heart is in the things I choose to do. Many times our motives behind our actions counts more that the actions themselves and we see illustrated through Acts 4 and this post. this was a great article on Barnabas. I like how you explained what his name meant, and how the name could mean two different things. this is something that I need to remember as I read through the Bible that every word has meaning. so often I forget that each word of the Bible could be taken and used for an article like this. and have so many things be said about it. I love thinking how much sure weight Gods words have, this is something that I need to remind myself of every day.